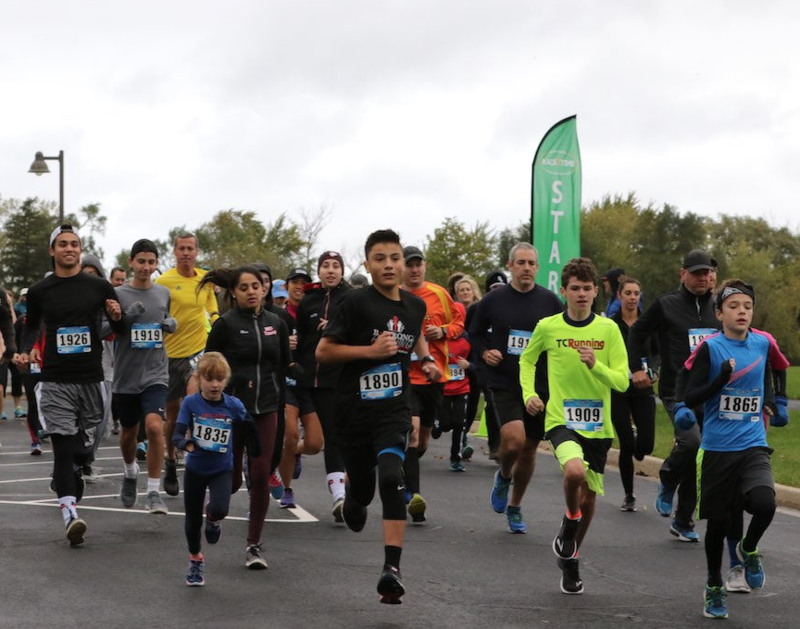 More than 150 people gathered at Citizens Park in Barrington on Sunday morning, October 15th for BStrong Together's first annual Joe Kelsch Memorial Run/Walk and Family Fun Festival. The day's festivities included a timed 5k run that took runners around Citizens Park and long the beautiful path into the Flint Creek Forest Preserve, as well as a 1-mile timed run and a 1-mile community walk perfect for participants of all ages. More than 50 student volunteers from Barrington High School and BHS's Broncos Committed hosted games, face painting, and other activities for children, and could be found cheering on runners and walkers as they moved along the 5k and 1-mile courses. Heinen's of Barrington hosted a table at the event offering fruit, granola bars, and reusable water bottles to attendees, alongside coffee from Pepper Park Coffee and bagels and schmeer from Einstein Bros. Bagels. The BStrong Together Joe Kelsch Memorial Run/Walk and Family Fun Festival was a great success, providing funds to support BStrong Together's efforts to enhance the health and well-being of Barrington area children and youth in mind, body, and spirit. Event organizers - Anne Horwath, Amy Winkelman, Susie Savage, and Kyle Kick - are already excited to start planning for next year's event. The event was a wonderful illustration of BStrong Together's motto – we are stronger together!